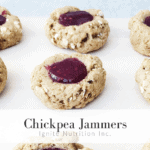 Nutrition and Non-Celiac Wheat Sensitivity: What You Need to Know | Ignite Nutrition Inc. There is no doubt that gluten, wheat, and carbs as a whole have been getting a bad reputation in the media. For those with celiac disease, it is medically necessary to avoid gluten. However, many individuals that avoid gluten for reasons other than celiac disease fall into different categories, either being that it seems wheat might bother their stomachs, or that a gluten free diet is perceived to be healthier. This begs the questions – what does it mean if you react poorly to consuming wheat products, but have a negative celiac diagnosis? Can gluten still be the culprit? Or is there something else about wheat that causes digestive upset in certain people? I’m GI dietitian, Marlee Coldwell, with Ignite Nutrition and today I am going to review a condition called non-celiac wheat sensitivity (also known as ‘non-celiac gluten sensitivity’ though you’ll soon find out why the name was changed) in which people have unusual reactions to wheat, but do not test positive for celiac disease. I GET that people have had notable symptom improvements from avoiding wheat! Why is that? Well – we think we have the answer for you. Today, I want to dig into what the evidence says – and most importantly – what we can actually do about it to feel better, hopefully while liberalizing your diet! What is Non-Celiac Wheat Sensitivity? Non-celiac wheat sensitivity is not the same as the autoimmune disorder, celiac disease, a condition in which the body reacts to consuming gluten by producing IgA antibodies as a way to protect itself. It perceives gluten as being an invader in the body that needs to be removed. The jury is out on whether non-celiac wheat sensitivity causes an activation of the immune system. Some studies have shown there is immune activation, while others have found there is no immune involvement. Non-celiac wheat sensitivity is not an IgE mediated allergy in which anaphylaxis occurs – think peanuts or bees where someone might need an Epipen! What are the symptoms of NCWS? How is non-celiac wheat sensitivity different from celiac disease? Celiac disease is an autoimmune condition in which the body’s immune system perceives gluten, a protein found in wheat, rye, and barley to be an invader that needs to be eliminated. In response, the body’s immune system creates antibodies to “fight” the gluten. This process leads to serious damage to the lining of the small intestine, as well as inflammation. Symptoms of celiac disease are very similar symptoms to NCWS, but keep in mind – some patients with celiac disease have little or no symptoms. Symptoms may not correlate with the severity of the disease or damage to the intestine. Due to the intestinal damage in celiac disease, there is a higher risk of vitamin and mineral deficiencies, anemia, and long-term digestive problems if the condition is poorly managed. For this reason, a strict, lifelong gluten free diet is needed. Even crumbs in a shared toaster can cause damage to the gastrointestinal tract of those with celiac disease. At this point, we are not sure whether non-celiac wheat sensitivity is this sensitive, but it is believed that those with NCWS may have more of a dose-dependent response. There is a lot of interest in better understanding the pathways in which non-celiac gluten sensitivity occurs. 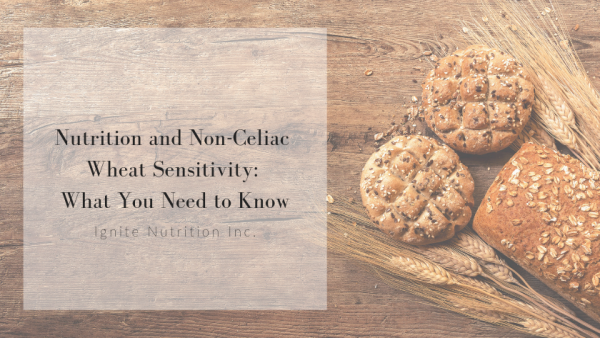 While we have some theories, it is also possible that different people experience non-celiac wheat sensitivity for different reasons! The biggest question is: is non-celiac wheat sensitivity an allergy, intolerance, or sensitivity? One belief is that non-celiac wheat sensitivity could be an IgE allergy to wheat in some of the population. Many individuals with these symptoms have never been tested for an IgE wheat allergy before, so it is important to rule this out, especially if there are extra-intestinal symptoms. If celiac disease and IBS have been ruled out, having your doctor refer you to an allergist for a skin prick test or a blood test is recommended. These tests detect the presence of immunoglobulin E antibodies in your system after being exposed to wheat protein and are not the same as IgG testing, which is NOT evidence based for allergies, sensitivities, or intolerances. Another theory is that those who react negatively to consuming wheat may have an intolerance to a different component in wheat other than gluten. In particular, much of the evidence looks at fructans, a short-chain carbohydrate found in wheat, rye, barley, and some of our fruits and vegetables. A significant group of people with NCWS do not achieve adequate symptom relief from simply consuming a gluten-free diet. One study showed that many NCWS patients still had both intestinal and extra-intestinal symptoms after following a strict gluten-free diet for years. This has led researchers to believe that something else is going on and NCWS patients may not need to be quite so strict with gluten-free eating – because it might not be the gluten at all! The interesting thing about the research on fructans and other FODMAPs is that it explains why these individuals may not feel better from simply removing gluten. As mentioned above, fructans can be found in other foods as well, so it may also be appropriate to reduce foods such as onion, garlic, and beans to ensure fructan intake is low across the board! Another belief held by researchers is that these individuals have a non-IgE mediated immune reaction to a component in wheat – AND again – it may not even be gluten! With non-IgE mediated immune reactions, patients do not have the same anaphylactic symptoms seen in IgE allergies (think hives, airways closing, and swelling of the lips and tongue). Non-IgE mediated immune reactions can present in a variety of different ways, including gastrointestinal symptoms. In this theory, components in wheat inappropriately activate an immune reaction. 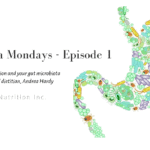 Interestingly, the gut microbiota may be involved in this – calling to question the role a healthy gut microbiota plays in preventing development of both NCWS and celiac disease. Another theory is that non-celiac wheat sensitivity elicits a similar response to histamine intolerance and therefore the two might be linked. However, it is important to recognize that correlation does not always mean causation – we can find similarities between almost anything if we look hard enough – so more research is needed. The best course of action when identifying non-celiac wheat sensitivity is to first rule out celiac disease. Perhaps this goes without saying, but you’d be surprised how often this step gets overlooked! Additionally, physicians may choose to test for true wheat allergy by ordering a wheat-specific IgE blood test and a skin prick test. In Canada, the diagnostic protocol for celiac disease requires a blood test, followed by an intestinal biopsy if the blood test was positive. If you suspect celiac disease or NCWS, it is crucial that you do not eliminate wheat from your diet prior to getting a celiac screen blood test. Prematurely eliminating wheat from your diet can make proper diagnosis extremely difficult and may require you to add wheat back in, which patients are often very worried about doing. If this is the case for you, we can help you come up with a plan to do this safely and in as best control of your symptoms as possible. What happens after celiac screening? So, you don’t have celiac disease – what now? At this point in time, we don’t have a medical test that can confirm non-celiac wheat sensitivity. The next step is to identify whether this is an intolerance or sensitivity – through proper elimination and reintroduction. From a practical standpoint, we treat non-celiac wheat sensitivity as a sort of sub-category of irritable bowel syndrome. Both conditions generally show symptom improvement with elimination of specific types of carbohydrates called FODMAPS. 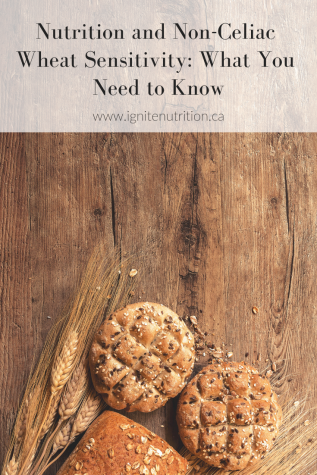 Our Dietitians at Ignite can help you determine the best course of action, and it will depend on your current consumption of wheat, and how your symptoms are doing. Typically, though, we may consider doing a low FODMAP diet prior to eliminating wheat or doing a low FODMAP diet on top of your current wheat restriction. After doing this for 4-6 weeks, we would re-evaluate and reintroduce strategically – teasing out whether this is a FODMAP intolerance, or possibly, a wheat sensitivity. Until we have better tests for NCWS, we do not know if simply eliminating wheat and having a positive response is enough to say “yes, this is non-celiac wheat sensitivity” however, it can give us a practical idea on what diet may be best for you – quality of life wise. In our practice, we usually find out that you don’t need to be quite so strict with wheat! This is often a relief to patients to not have to worry about cross contamination, eating out, and have the ability to liberalize their diet much more than they expected. As you can probably tell by now, the diagnostic criteria and treatment options for non-celiac wheat sensitivity actually go hand-in-hand. As digestive health professionals we often look for diagnostic answers while simultaneously managing symptoms, as is the case with NCWS. Overall, management of non-celiac wheat sensitivity involves a multidisciplinary approach. It is recommended to work with a team of professionals including your family doctor and a registered dietitian. Working with a gastroenterologist may also be warranted in some patients. As noted above, working with a dietitian to eliminate FODMAP-containing foods is generally the first line treatment. Depending on your symptoms, your dietitian may suggest a simple wheat-free diet instead, followed by a challenge phase. However, studies show that many individuals with non-celiac wheat sensitivity still have significant symptoms after eliminating just wheat. This is why we often take a close look at your symptoms and consider the low FODMAP diet, followed by strategically re-introducing foods to identify which FODMAPs (and how much) you can tolerate before having symptoms. Wheat falls under the ‘fructans’ category of the low FODMAP diet, therefore it is thought fructans may be the cause of symptoms for some individuals. During the re-introduction phase, we can then see how patients respond to wheat compared to other fructans like onions and garlic. We can also see how you do while consuming low FODMAP wheat products. This will allow us to assess whether this is related to a fructan intolerance, or if you truly struggle with wheat. Because the pathophysiology of non-celiac wheat sensitivity is still fairly unclear, it is difficult to say whether it is the gluten, fructans (the non-gluten parts of wheat), or something else entirely that cause symptoms. There is no evidence to show that the low FODMAP diet is the best way to treat NCWS. However, this approach makes sense from a clinical perspective and often results in diet liberalization. This can be done safely with dietitian supervision and is not invasive. Sounds like a win to me! At Ignite Nutrition, we take a holistic approach to health. Therefore, we want to consider not only diet, but also non-food causes of digestive issues. One of the biggest lifestyle factors impacting the gut is stress – after all the gut IS your second brain! Reducing stress with mindfulness-based therapy is often a key component in reducing symptoms such as bloating, changes in bowel habits, and pain. There is no doubt that functional gut disorders and food restrictions can lead to even more stress and anxiety. If you feel stress may be exacerbating your digestive symptoms, it is a great idea to talk to a professional like a psychologist or counsellor! If you suspect you may have an intolerance to wheat, go to your doctor right away and get a blood test to rule out celiac disease BEFORE cutting out gluten – and remember, NEVER cut it out as your ‘first line defence’, as it will make proper diagnosis very challenging! Once you have been tested for celiac disease, your test results will then determine the next steps in the management of your symptoms. Working with an RD at Ignite Nutrition to begin to tease out if your symptoms are linked to non-celiac gluten sensitivity is your next step. While we don’t have a test for this, with proper implementation of diets like the low FODMAP diet, we can help to guide you through managing your GI symptoms and living with a better quality of life!